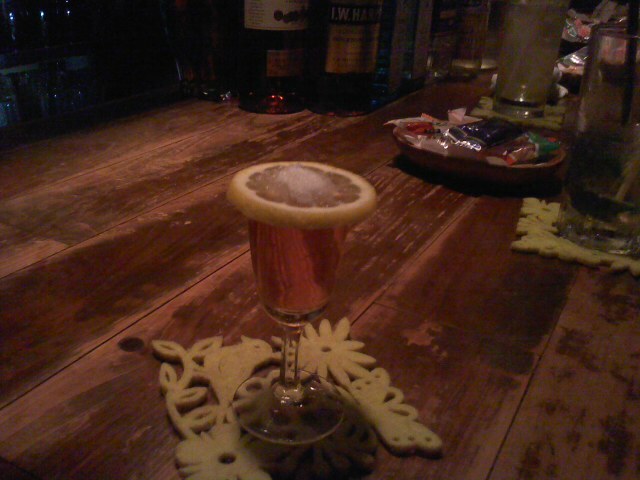 I mentioned a bar named France Ya, which is located in Douza in Nagasaki, in this blog before. At first I didn’t have any knowledge about alcoholic drinks so I used to order drinks in alphabetical order looking at the menu. Then I’ve found some cocktails or whiskeys good and some of them have become my favorites. The one particularly I love to drink recently is a cocktail called Nikolaschka. It is a simple cocktail which is served in a shot glass being filled with brandy with sugar on a round slice of lemon on the top of the glass. You put the sugar and lemon first in your mouth to crunch and mix them, then you wash down the brandy at one gulp. You would be in heaven for several minutes before you swallow them down. The taste of the cocktail is, in my opinion, outstanding among drinks in the world. I heard it is called a cocktail made in your mouth.